Due to a rebranding and relocation of the business, Lifeways were reviewing their supply and management of marketing print and printed corporate stationery. The new branding meant that various marketing collateral and business print would need to be produced to align with the launch. In addition, as an organisation with multiple locations a streamlined online order system was required, allowing various cost centres/locations to order both stock and print on demand items as required, and giving the central marketing team full visibility of order levels and options to control access as required. In addition a strict budget was set (and met) for a complete suite of new products, from brochures and leaflets to corporate stationery, posters and pop up roller banners. With the investment of new branding, the Lifeways brand integrity was paramount. As sole supplier, PrintTeam were able to monitor and maintain the print continuity of the brand. The new brand guidelines were audited and discussed at the outset to set quality and control benchmarks, including the colours, materials, and logos used across the range. We gave substrate advice and provided sample proofs on suitable papers, before a cost effective FSC option was chosen, enhancing Lifeways environmental credentials. The suite of new products was produced complimentary materials, ensuring a high quality, consistent finish across the range. We implemented an online order system, enabling staff to order print items when required and giving full visibility of usage levels to the central team. 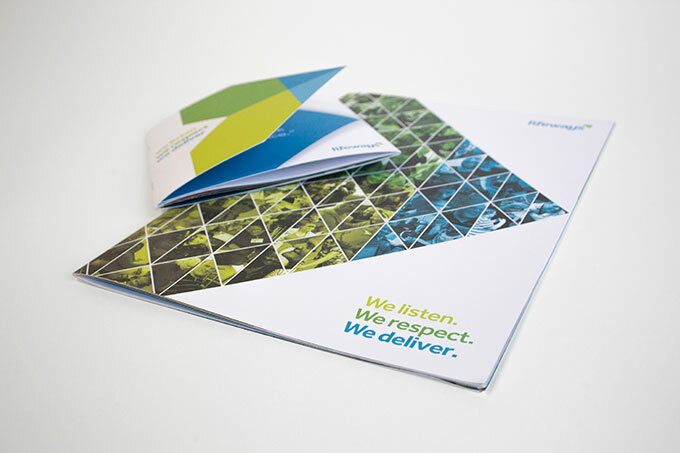 Previously ordering, stock and despatch had been a manual process carried out by the marketing team. Providing an automated solution has enabled the team to refocus their time and save space, increasing efficiency for the department. The system also provides instant dynamic proofing, negating the need for endless versions and PDF proofing. With 33 locations, stock, despatch and delivery was also an area where we could improve efficiency for Lifeways. All core print products are held in stock without storage fees, with automated daily stock reports – including demand patterns – provided. Minimum reorder levels have been set to ensure 100% availability. As Lifeways office supplies provider, we deliver stationery and print on the same delivery, further reducing Lifeways carbon footprint and administration time. Lifeways is one of the UK’s leading providers of support services for people with diverse and often complex needs in community settings. With Head Office now based in Southwark Bridge, London, there are a further 33 centres throughout the UK utilising a mix of stock marketing literature and print on demand items.